Today I am thrilled to have Jessica Thorpe on the show. Jessica is the President of Gen.Video which is a site that matches businesses to influencers especially in the video space. Now if you’ve been selling anything online, you know that influencer marketing is huge. One of my prior guests Emmanuel Eleyae in episode 57 used You Tube influencers to generate 65K in 4 months and is now making 7 figures. Anyway, Jessica’s company Gen.video is at the forefront of influencer marketing and we’re going to pick her brain today about the best ways to leverage influencers to promote your business. How a content creator can make money with influencer marketing. Today I’m thrilled to have Jessica Thorpe on the show, and Jessica is the president of Gen.video which is a company that specializes in influencer marketing and ecommerce video. Today we are going to explore how to leverage influencers online to promote your products and ecommerce brands. Now before we begin I want to give a quick shout out to Seller Labs who is a sponsor of the show, and specifically I want to talk about their brand new tool Ignite which helps sellers manage their Amazon sponsored ads. Now right now I’m actually using this tool to manage my Amazon sponsored ad campaigns, and it makes things a heck of a lot more convenient. So number one I’ve always found it a major pain to generate my PPC reports on Amazon, cut and paste the data over to an excel spreadsheet and use pivot tables before I’m able do any analysis. Now Ignite pulls all that info for you automatically and allows you to easily see what keywords are working and what are not immediately, no need to manually create reports or play with excel. So let’s say one of my hankie keywords is bleeding money, well Ignite will alert me of that fact and I can reduce the bid immediately. So bottom line Ignite makes managing your Amazon sponsored ads so much easier and the fact that they provide me with alerts means that I no longer have to monitor my campaigns like a hawk. So if there are keywords that are doing well, Ignite will tell me to add them to my exact match campaigns, and if my keywords are losing money, Ignite tells me to either remove the keyword or to reduce the bid. So head on over to sellerlabs.com/steve where you’ll find awesome tutorials on how to run Amazon PPC ads and the opportunity to try Ignite for 30 days for free. Once again that’s sellerlabs.com/steve. Now I also want to give a quick shout out to Klaviyo who is also a sponsor of the show. Now I’m super excited to talk about Klaviyo because they are the email marketing platform that I personally use for my ecommerce store, and I depend on Klaviyo for over 20% of my revenues. Now you’re probably wondering why Klaviyo and not a different provider. Well Klaviyo is the only email platform out there that is specifically built for ecommerce stores, and here’s why it’s so powerful. Klaviyo can track every single customer who has shopped in your store and exactly what they bought which makes it extremely powerful. So let’s say I want to send an email to everyone who purchased a red handkerchief in the last week, easy. Let’s say I want to set up a special autoresponder sequence to my customers depending on what they purchased, that’s a piece of cake, and there is full revenue tracking on every single email. Now Klaviyo is the most powerful email platform that I’ve ever used and you could try them for free at mywifequitherjob.com/K-L-A-V-I-Y-O, once again that’s mywifequitherjob.com/K-L-A-V-I-Y-O. Now on the show. 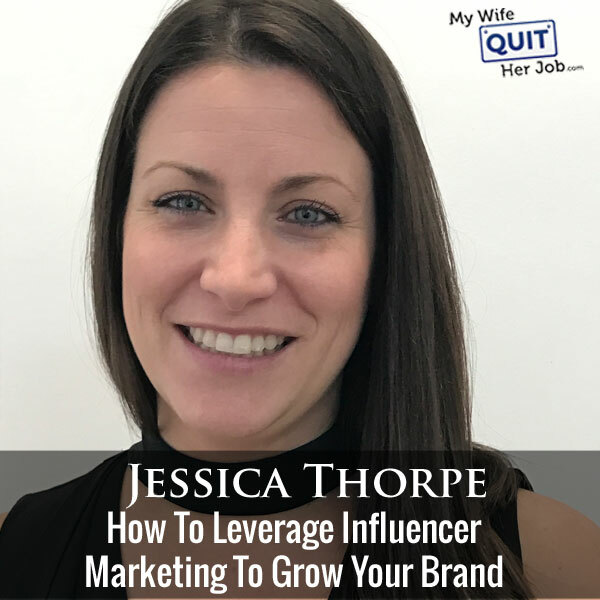 Steve: Welcome to the My Wife Quit Her Job Podcast, today I’m thrilled to have Jessica Thorpe on the show. Now Jessica is the president of Gen.video, which is a site that matches businesses to influencers especially in the video space. Now if you’ve been selling anything online you know that influencer marketing is huge, and if you listen to my podcast one of my prior guests Emanuel Eleyae in episode 57 used You Tube influencers to generate over 65K in four months and his company is actually now making seven figures based on influencer marketing. Anyways Jessica’s company Gen.video is actually at the forefront of influencer marketing and we are going to pick her brain today about the best ways to leverage influencers to promote your business. And with that welcome to the show, how is the going Jessica? Jessica: Hi Steve thanks so much for having me, things are going great. Steve: So Jessica give us a quick background story and tell us why you created Gen.video in the first place. Jessica: So about two years ago myself and my co-founder Bill Hildebolt saw a need in the marketplace to bring together influencer marketing in ecommerce. Prior to starting Gen Video we had worked together for a number of years in the video space and working with user generated content, and so we were excited to find an opportunity to bridge the gap between influencer and ecommerce. Steve: So at the time were you guys running any sort of ecommerce businesses yourselves or were you guys influencers yourselves? Jessica: No, interestingly enough he came from a banking — investment banking background and I came from the media side so I was very familiar with video production and the media landscape. So we saw an opportunity to help brands through the story telling and in the visual nature of video as a medium to help bringing their products and brands to live through video, and then of course as the importance of a rich media experience became important on the ecommerce side, really saw some synergies between those two and again set out to develop a product and a platform that could really unlock that opportunity for brands and sellers of all sizes. Steve: Interesting, I was just a little curious like when you’re starting a company that manages influencers as well as businesses, this is like a chicken and egg problem in the beginning, so who did you guys go after first, was it the influencers or the businesses, how did you get it done all to come together? Jessica: Yeah it’s a good question and it’s very much a chicken and an egg situation and it’s still is to some extent in terms of making sure that the network isn’t so large and vast that there is not enough opportunities for them to partner and engage with brands on one side, or if that isn’t necessary to making sure that you’re building enough features and tools and services to allow them to get more value out of things they’re already doing on the social media side. But then also as brands can come in and across all categories we’re not category Gnostic and so someone who sells a beauty product can come in and two minutes later someone that sells a pet product can come in. It’s making sure that that network of content creatives is always there. So we’ve actually built the team in such a way that we’re constantly focused on both sides of those business opportunities. But it is something that all social platforms, certainly market places don’t have built technologies to enable the match making if you will, it’s something that everyone I think is trying to balance as best as they can. The last thing you want is to have too many content creators not fully engaged, because when there is something for them they might have checked out or tuned out a little bit if you’re not constantly bringing value to them. Steve: Sure, actually let’s take a step back, what is Gen Video, why are you guys different, because there are other competing platforms out there, so what do you guys specialize in? Jessica: We really specialize on bridging the gap between influencer and ecommerce, and so that means something different for the content creators then the brands. So on the content creative side of things we very much appreciate the fact that it’s probably really scary to have all your eggs in the YouTube basket. So we think about other feature sets and monetization opportunities for them that go beyond the walls of YouTube or and in other social platforms. So we build some technology that helps them automate the creation of affiliate links, and so what we found was not a lot of YouTubers, it certainly wasn’t just getting suddenly necessarily understand the Amazon associate program, and even if they do want, using it actively because it was pretty time consuming, so built some functionality to help ease the ability for influencers to augment, and have them make money off of YouTube. So the affiliate revenues one we also have made it easy for them to license pre-existing videos, and so a brand can come to the platform and if they see an influencer already made a product video from one of the products that they sell, with a couple of clicks of the button that influencer can make that existing content available, and so again thinking about how to give them other ways to monetize their content. Then on the brand side what does that mean? Similarly we don’t think that there’s only value to be had publishing a video to YouTube. So when I think about the influencer marketing landscape or the dozens if not hundreds of platforms that say that they can play matchmaker between influencer and brand, a lot of times that’s being looked at from more of a top funnel awareness rich perspective. It’s true YouTube is a fantastic platform, Instagram is a fantastic platform to reach your target audience and get in front of them. Influencers are a trusted source for product information but why have that video be trapped on YouTube where after a couple of months 80, 90% of the viewership has happened and the value starts to slowly decline over time, when that’s an amazing video, it’s on brand, it’s talking about the product features and benefits. So what we did is said why don’t we build something that really allows a seller to get more value out of that content and use it on your website, use it in other marketing, use it in advertising and most importantly we focus on the ecommerce angle is getting that video on product pages of retailers where you’re selling products. Amazon being one of the primary, Wal-Mart a close second and then dozens of others are available, but it’s again unlocking the potential of that social content and bring into the ecommerce environment where it can impact more people than just the audience of that influencer, then also the ability to drive traffic from the social platforms into Amazon to bring more consideration to the product pages. So it’s really finding those opportunities for brands to get more value out of influencer to drive sales. Steve: So let me just kind of summarize what you just said, so what you’re telling me then is that I can have an influencer record a video that goes on YouTube as well as Amazon as well as Wal-Mart as well as other places like the same exact video is indicated across all those platforms? Steve: Okay, and so traditionally then I guess the usual model is that I would just pay a YouTuber and it would just live on YouTube, but now you’re actually getting more value out of that same piece of content, is that right? Jessica: Yes, it’s through the way that we’re collecting the content and again for brands that are maybe aren’t looking to post the content on YouTube and it’s really more of ecommerce play, I want to optimize my product page, and I know that having a how to video would really help drive conversion, what we do is we ask all of the influencers for their content only and then someone who may own a part can speak to whatever their product needs are, but you don’t want that video published on YouTube, there is an opportunity to do that as well. So it really allows the seller to cater their campaign based on their needs and only their needs. Steve: So I could have someone just do a sales video for me essentially is what you’re saying? Steve: Okay, all right so let’s make this super practical, like let’s say I am a brand, I’m a brand new business and I want to do influencer marketing. So let’s say I approached you directly Jessica, first of all a couple of questions here, influencer marketing, is there like a certain product or product category that kind of works best for this or can I actually just take any mundane item like a garlic press and make sales through influencer marketing, like what type of products work best for this? Jessica: You know we could ask that question all the time and I believe this answer to be true but it always seems a little self serving when you first say it. I think any product that could have a story told through a video, through a person, there is a place for influencer marketing. So the example that you gave I was thinking, I’m like oh I wonder what he’s going to say to try to stop me. A garlic press, I mean there are so many influencers that make amazing recipe content on YouTube, and so you look to the influencers to find that creative connection between your brand and the product so that it can resonate with their audience first and foremost, and then what our platform does is then make that available to anyone who is shopping. So chances are if you’re buying a garlic press you need garlic for something, for what, a recipe, and so there are very natural applications or ways in which influencers can integrate your product into a piece of content. So it really requires a little sharing of information and understanding the product, but that’s what they’re good at, they a master at their craft making video content and bringing a product to life and in their own words and in their own needs. So you get kind of a two for one in the sense where you’re getting their review of the product, you’re seeing a product demonstration so you’re getting a little bit of a how to, and what we’re hearing from shoppers online is it is the next best thing to touching and feeling a product in store. So the more you can remove whatever the barriers are which would prevent someone from buying that specific product online versus feeling the need to go into a store, video really can close that gap a bit because through the words of actual online shoppers, we’re hearing them say just that, it’s great for product comparison but it’s also the next best thing to touching and feeling of product before making that purchase. Steve: Okay so let’s kind of expand upon that a little bit. I’ve been thinking about this too because we actually used your platform to do an influencer campaign and I was thinking about a lot of these things when I was deciding like what type of campaign to do. What kind of videos tells what the best, like straight off testimonials, kind of like mentions, kind of mixed in with the content so to speak like branded in with some other piece of content, or like just seeing the item in action and then just casually mentioning it, what’s worked the best for the people using your platform? Jessica: Yeah also we have brands of all sizes using the platform and so I’ll give kind of middle of the road answer, but you painted the right picture in terms of the spectrum of content. So if the primary need is product education and working to help convert people to buy certainly product reviews, unboxing tutorials, how tos, those are all things that are pretty endemic to the shopping experience. So if you’re watching a video on a page on Amazon, a product detail page, you’re probably looking for more specific information. Either you’re just about to buy or you’re just looking for some final information to validate, yes it is going to solve the problem that I have, those are the types of videos that work well. That being said because you’re tapping into experts in your category and folks that have social presences, you can actually get more value by letting them think about how to creatively integrate your product into their video. So I’ll use beauty, beauty is actually a really good category, so video and it’s popular on YouTube. Get ready with me videos are very popular, they drive a lot of viewership and they’re the perfect backdrop to integrate a brand and product into it. But those videos are ten, 12 minutes long, I mean she’s doing her hair, her makeup, her clothes, you name it, she’s talking about it in that video. Getting the influencer to integrate your product into the first minute or two minutes of the video of a 14 minute video is a great way to get in front of her audience and get them to click on the link in her description to drive traffic to your product page, but you probably don’t want or don’t need that 14 minute video on Amazon. I will say that we see like well over 50% completion rate for most of the videos that get syndicated to the related video strip. So it’s not to say that the shopper doesn’t get value out of it, but for some of our clients we actually even cut out that one minute clip and only put that up on the product pages. So again I think that’s the beauty of working with influencers, they are very accepting of your needs and can find the right way to integrate your product, and that maybe a single two minute video like just as a product review and works on her channel and works on the product pages but maybe not. Our platform and our services allow you to get the festive both worlds and just requires you to know what you’re looking to get out of it up front and then they’re very eager and happy to collaborate with you, and we make it really easy through our messaging system to have those one on one dialogues with the influencer which helps you enjoy the – you get what you want the first time around. Steve: Okay so let’s walk through a campaign actually which will probably make it easier. So let’s say I go on the platform, what’s my process, like what will my criteria be for selection? Steve: Let’s go with the garlic press example for example. Jessica: Perfect, okay so you decide the platform and then we’ve got a pretty intuitive, well we call that campaign what’s there, again it’s a five step process where you first would let us know what your distribution needs are. So we’ve got the ability to work with influencers across a number of social platforms not just YouTube, so YouTube, Instagram, Twitter, Facebook, basically any platform that’s been focused on a video experience and has an API we’re working with. So you can say I want to work with someone who’s both on YouTube and Instagram because I really want to make sure that I can tap into that foodie culture that’s on Instagram, but I really need YouTube because I want someone to be good at creating video content and I want that video to live on Amazon as well. So you check off YouTube, Instagram, and Amazon. If you also sell on Wal-Mart, we’ve got a level of service that includes both Amazon and Wal-Mart distribution. So you check off what social platforms you want the video or piece of content published to and then you check off Amazon or Amazon or Wal-Mart depending on where you sell, and then from there we start to ask you to fill out some pretty basic information around who your target customer is, age, gender, area of interest. So for this I would say you most likely are picking maybe male and female in a pretty broad age range, but you might type in the word recipe or foodie. By giving us those types of tags, it filters down the set of influencers that we have in our network, so we can recommend to you people that are already creating this type of content and have an audience that is totally receptive to videos where a garlic press may be integrated in to it. Steve: Are these, the things that I’m typing in, is that a human looking at that, or are you matching people based on like an algorithm? Jessica: It’s all data driven by the information in the platform and so because we have everyone connect their YouTube channels, we’re pulling in all their channel audience information, we know their date of birth, we know if they have kids. Steve: Yeah what are some good guidelines there? So let’s say I put in like I want food or people who create videos about food at that point, so how do I narrow down – like these are all questions I would have if I was doing influencer campaign, how do I narrow people down, what’s some good criteria and how much is it going to cost me based on their audience size, what are things to look for? Jessica: So what I tell is first and foremost if you’re not looking to get the video published in their social channel you can order a video for as low as $500 and that’s kind of the minimum where we feel the production quality of the influencer is sufficient and high enough quality to stand up to sitting on your product page. It’s one thing to work with influencers on YouTube but another thing to bring that content on to your product page and you spend so much time optimizing that is so much closer to the point of purchase. So it starts at 500 but then it really scales up infinitely based on the size of the channel, and so I think about a garlic press and again let’s say you want to target a mum blogger who likes to cook and is actively talking about creating meals for her family. You could probably work with an influencer who has 200,000, 300,000 subscribers on YouTube and maybe a relatively similar audience on Instagram and work with them for $4000, $5000. Steve: Is this for one video then? Jessica: This is for one video except the thing there is when you start to work with the larger channels, you’re really tapping into their audience, and you would think about it almost the same way you would decide if you’re going to spend some money on Facebook ads or other more traditional advertising. And so it’s not just the cost of the content, it’s the content plus her big an audience. Jessica: And so that video on average could get a round 100,000 plays and I’m just using kind of big general numbers here, but what we see is that any program when you’re working with the right influencer that matches your product in a very organic natural way, we can see click through rates of the link in the description that goes to your product detail page in the 4, 5, 6% range. Jessica: We’ve seen some programs that go to 10%, and so you could easily drive a couple thousand people to your product detail page to learn more about your product and hopefully buy. The great thing about the programs are that content will also live on the product page, so you’re not just getting the value from the YouTube publishing and topic but now any other visitor to that page from other marketing you’re viewing, if there is organic search from Amazon, that video sits there too, so you have the second opportunity maybe to help convert people by them watching those videos. Steve: So I know like I never click on the links below the YouTube videos especially if I’m watching something on mobile, do people really go to the product page by clicking like a large percentage, like 5% sounds like a lot to me. Jessica: Well so it is a lot especially if you think about it relative to what a typical click through rate is in an immediate campaign. Some good Digital Lab campaigns, a 1% click through rate is super high, sometimes with video or [inaudible 00:24:12] you’re looking at 0.9% click through rate. So it is certainly high relative to other media spending, and then even from a YouTube click through rate perspective I think you’re typically seeing on average maybe around a 3 or 4%. But again everything that we’re looking at is optimizing around the shopping experience, and so unless someone is using the platform and looking just for rich something just purely entertainment based, we’re always going to recommend and our platform is going to suggest people that do a better job bringing together the social and ecommerce. So we look at people and understand what their click through rate and conversion rates are, and are using that to just get smarter and smarter about our recommendations to you. So that’s why we’re for sometimes seeing higher click through rates, and the thing is they may not buy immediately after clicking that link, but they’ve watched that piece of content and now you’ve got your brand in their consideration set, and so getting them to come back is where there are other interesting opportunities as a seller to bring them back to the site. A 5% click through rate is actually really high relative to other marketing tactics. Let me ask you this, so you mentioned subscriber base and then you actually mentioned video views, is that a better way to judge the influencer, like I suppose the number of subscribers they have but I actually consider it based on the actual views they get per video, like what are you paying for here exactly? Are you paying for subscribers, are you paying for views on the scale? Jessica: Well so what I would say is as you are going through the process and once you fill out all this information and the campaign is live and you’ve got influencers applying, you certainly want to look at the relative views per subscribers, and so we provide some average view data and the user profiles and you want to start to think about it from a cost per view perspective. There is some hard costs for them in making the video but really if a channel is not driving at least 10% of their subscribers and viewership, so their 100,000 subscriber channel, you’d like to see 10,000 views come out of that. There are some channels like in consumer electronics, there is this guy in particular that I’ve seen counter come through, he’s got close to 400,000 subscribers. Easily his videos get 150,000 to 200,000 views and so he’s really good at engaging his subscriber base. But as the channels go up, if the engagement rates go down you don’t want to pay a ton of money just because they have a million subscribers. You really want to make sure a good amount of them are actively engaging with their content and watching it or you’re not getting what you paid for. Steve: So what’s a good guideline for the amount of money that I would want to pay based on the number of views that the videos actually get, like how much would I want to pay per view? Jessica: Every category is different and it’s kind of like supply and demand. Some categories that are pretty niche in nature, the influencers can charge a little bit more because there is fewer of them, but I like to make sure that the influencers that we’re suggesting brands are working with see 10% in terms of viewership to their subscriber base. Then relatively speaking an average cost per view it really ranges by vertical and also by size of influencer and so with 30 cent, 25 cent cost per view is good, and then that can go down quite significantly with scale as you work with larger influencers. Then obviously that is capped out or dictated to some extent based on the size of the brand and their marketing budgets in any month, but that’s a good target I think for people looking to get started. Steve: One of my other concerns like if I were to use a platform is like I pay someone to do a video for me, what if I’m unsatisfied with the video, how are disputes resolved in case they do a job that is like not optimal, and I can’t really end up using their video or they just don’t do a good job on their YouTube channel? Jessica: That is something that we take really seriously and we always work to make the seller happy, and so if that means finding another creator or stepping in if for some reason the creator goes quiet for a little bit of time, we try to build up enough tools to really make it self-service and the influencers have the ability to collaborate pretty closely with the brands. But from time to time some things happen, like gets in the way or maybe there was just some miscommunication or just general not satisfied with the content. It’s our job to make sure that the seller has a good experience, and so we get to really work to resolve any of those disputes I mean worth case scenario, refunding any money that would have been put down. But our priority is to ensure that they get the video they were looking for and so if that means starting over we do that, or we’re engaging a new content creator that meets all of their needs and one that we know because we’ve worked with them directly before are some of the things that we’ve done. I mean it will always be there, but the reality of having that kind of that experience should be pretty low if you’ve done your job kind of pre vetting things ahead of time and setting it up for success up front. Steve: Okay, no that makes sense, yeah if these people are treating it like a business; they’ll probably want to please the brand as well. Okay so here is another concern that I always have with this type of marketing like how do you measure the results? Jessica: There is two things here, so there is the social component, the distribution there, and so from that perspective it’s understanding what the expectation was in terms of viewership. We share play data engagements rates, and so engagement rates meaning likes, comments and shares, and so that’s another metric for brands to look at in terms of did this piece of content resonate with their audience, and so place and engagement rates are two metrics that we share about. Steve: Is that just for Amazon or that works for your own site as well, do you guys collect data on clicks to the site also? Jessica: Yes and so there are two options when you’re setting up your campaign, you either can attach the ASIN that you want the traffic driven to, and then that will go to the Amazon product page, or you can put your own custom landing page URL and we track those clicks. And so if you have a direct to consumer website and you would prefer the traffic to go there versus on Amazon, you would provide that URL that would get included in the description and our systems tracks that and it would get reported back on your site. So there is viewership, there’s the traffic and then the third component and this is the one where right now requires a little help from the seller is really looking at that pre post analysis, and so we’re really good at getting the content up on Amazon and right now the retailers are really good about providing play data and viewership data, so percent watched and the typical metrics that you would associate with video. However, you would be able to see, you as the seller will be able to look at conversion rates and sales pre video and post video, and what we’re seeing is across a number of different categories on average up to a 30% increase in conversion rates for shoppers that were watching the video and even seeing upwards of 15% increase in spend levels with just the presence of video there. But currently that specific information around your sales or conversion rate growth would be something you would see on your site within whatever analytics [inaudible 00:34:18] you’re looking at the seller central. Steve: So it sounds like the way I would measure this is I would take like a baseline and then the day the video goes live I would analyze that data and just compare it against the control so to speak, right? Jessica: Exactly we do a lot of pre post analysis so even for videos that maybe were live for an extended amount of time, some year over year, for a 30 day or for a quarter or something like that but exactly. You guys know best what other promotional activity is going on, and so it allows you to kind of isolate those things and really look at the data, but yes exactly is what were your sales like prior and what were your sales like after enriching the page with a piece of video. Steve: So it’s important I guess then to not run any of these overlapping so to speak? Jessica: It certainly makes a lot easier for you to isolate what thing is working, but of course with some of the larger brands and sellers that we work with this is one tactic of many, this is still common side with promotions and so certainly from merchandising events like Mother’s Day is going on right now, Father’s day is right around the corner. I’d certainly say that ensuring content is up and live before you invest in other traffic driving activities is something I’d recommend because again if you think you manage it from a is it working standpoint, it does make it a little harder to isolate what, but I have seen enough data to know that placing a video does drive up those conversion rates, sales, basket size and just certainly if you’re spending all the dollars to drive more traffic, you’d want to make sure that you have the most optimized page possible. Steve: What are some video metrics that are good guidelines to follow like how do I know what good engagement really means in your experience? Jessica: Percent watched is a metric that gets looked at a lot from a peer video perspective, and so if you compare that to whether a traditional 30 seconds pod [ph] is like there is either two things, it’s time watched, and so getting someone to watch for at least 30 seconds or a minute or completion rate per second watch. So what we’re seeing is on Amazon we’re seeing people watching video for on average a minute if not more and from average completion rate standpoint for videos that are under two minute let’s say watching close to 70, 80% of the video. So I think there is this misconception in the ecommerce environment the video is going to be really short, they’ve got other things they really want to do, but the reality is especially when it’s coming from an influencer, if it’s helpful information and if it’s either answering their questions or providing information on the features and benefits of the product, they’ll tune in and they’ll stay engaged, and it’s because it’s saving them time in the long run like they’ll be more satisfied, they don’t have to shuttle around so much. So it’s not always about really showing really quick pieces of content, I think it’s about being smart with the information and who’s bringing it to them. Going back to the original question it’s definitely percent watched is one. Steve: I guess what I’m trying to ask is like I produced the video with you guys, how do I know it’s actually good, like what percentage of people that watch 75% would be like a good metric to judge whether that video was a good one or not? Steve: What percentage would be a good percentage, if like 80% of the people watch 75% of the video? Jessica: I see, well yeah I think the way that we report the data and sorry I’m probably not answering this correctly, it’s the average completion rate. So we’re saying of the people that watched it they’re watching for more than 50% of it, and so I think the reality is there are very few people that drop off right away. So if you look at it from like a trend line perspective the majority of the people are watching for at least 50% of the video, and then there is a much smaller percentage that are watching for less. Jessica: Close to over 80% of them are staying too not that much because once they – there are two things that are happening. The audience of that influencer tunes in to them; they get emails when they publish their videos and so they are wanting to hear what she has to say. Then the other people that get there from search whether from Google or going straight to YouTube searching for – they were looking for a garlic press or they were looking for a recipe and so you’re getting these people that are kind of already leaning in. So if you pick the right person you know that they are good at what they’re doing and they are great at producing content, you’re not just blasting out a piece of media to this like look alike audience. It’s a tapped in engaged audience, and so therefore you’re seeing a high engagement off of that. Steve: Let me ask you this question, do the influencers – like can you have them insert your brand or keywords into the video title, is that something that’s typically done? Jessica: When you’re setting up your campaign, you can provide keywords and you can ask them to include them both in the title and descriptions, so this can help optimize all that video being discovered in search. So that’s absolutely something that you can do and when we’re talking directly to brands, we often suggest a healthy mix of both branded and non branded key terms and then leaving it up to the influencer, because the one thing I‘d say if you try to be too prescriptive on what the video title is, it may not resonate as well. So you can give them the keywords and then they will find good ways to integrate that both in the title and description, again so that can help optimize for search. Steve: So Jessica on the tracking side again, like when I ran my own personal campaign using Gen Video, actually very few people I found clicked on the link and most of the sales that I got were actually through type and traffic. So would you say that the before and after method is like the best way to track your campaigns and is there actually a better way to do it? Jessica: Definitely tracking pre and post video publishing is the preferred path in terms of being able to really monitor the impact of the video content, and so there are two different things. There is the traffic coming from the site and as we talked about a little earlier depending on the size of the influencer’s channel that you’re working with, you’re seeing roughly 3 to 5% click through rate on average. Some campaigns depending on the verticals can be upwards of like 10% in terms of a click through rate. So if you’re working with smaller influencers, and really testing things out with a smaller budget, the traffic in and of itself isn’t really where you will look in terms of understanding the ROI and the value. What I would recommend is looking at the analytics that you have either on your website if you chose to drive the traffic directly to your brand site or through the data that is provided to you from Amazon and look at what your sales were relatively – I take 30 days or so before the video was published and 30 days after. If there is a bit seasonality with your product, the other thing that you could do is look at that same time period from the year before. Really what you want to do is understand after placing that video on your product pages on Amazon, were you seeing higher conversion rates than prior, and then the traffic is kind of a secondary component to that. Again that really becomes a little harder to do though unless you’re looking at influencers that are driving more substantial traffic to the site. Steve: Okay, well let’s switch gears a little bit and talk about this from the perspective of a content creator. So I’m a content creator, I run a blog, so what kind of advantages does your platform provide like how can a content provider make money and what’s the cut that you actually take? Jessica: So for creators we like to invest in features on the platform that help them monetize all of the content that they’re creating. So some influencers are publishing videos on a weekly basis, sometimes multiple times a week, but not all of those are part of brand sponsorships, and so what we want to do is ensure that there are other ways for them to monetize that content. So there are three things that we’re doing, we’ve created the tool that made it really easy to create, and place affiliate links from the Amazon associates program directly into the descriptions of videos that are managed through the Gen Video platform. That allows affiliate revenue to be made for any of the viewers of that video that clicks on one of their links and then goes on and shops within that session on Amazon. So Gen Video doesn’t take a cut of any of that affiliate revenue. We pass through all of that back to the content creator, and for us it’s really how do we create a tool set that enables influencers to leverage us to manage all of their content, not just the brand sponsorship. For us really the value is the ability to understand the dynamics of the traffic coming from social, what shoppers are buying after watching a video and the data that we can then share back with the brands that are leveraging the platform. So any content creator that would be leveraging the affiliate link service that we provide will earn 100% of the revenue they would have made on their own with just a little ease of use in the creation and placement of those links. Then beyond that we offer creatives the ability to license any pre existing content that they have, and so a good kind for instance would be I know technology influencers spend a lot of time covering the latest iPhone or the Samsung 8 that just came out. But there are all these peripheries that come around; there is some chargers, cases, things like that. Those are products that get – there are lots of them out there and they receive a lot of coverage in terms of top five cases for under $50, or those types of editorial content. So for a brand that may not have the budget or desire to create something from scratch but found a video on YouTube from an influencer already, as long as that influencer is within our network you can go in and license that content. So it’s another way for the content creators to get this flat one time video license pre-existing content that they created without any sort of sponsorship behind it, and then of course we make available to them all of the opportunities for sellers and brands like what you did to apply and be considered for a more direct relationship with the brand. Steve: I’ve always been curious about this, so if I found a YouTube video of someone making a testimonial of my product, I can’t just put that YouTube video on my site? Jessica: You can embed the video using the YouTube player on your brand’s website, however in order for that video to live on let’s say on Amazon or Wal-Mart page you actually would need the physical asset to then upload it directly into one of the retailers platform. Jessica: And so the relationship we have on the creator’s side, we have them upload the content through Gen Video and then publish it to YouTube which allows us to have the asset for other ecommerce distribution as well. Steve: Okay that makes sense, so it seems to me like one of the things I’d like to buy your service, the main value add in my mind was the ability to put the video underneath the Amazon product, because this is something that you can’t really do on your own, like you need to have some sort of in with Amazon in order to put the video underneath the product? Jessica: Yeah there is definitely different parts vendor central and vendors are able to get content up in the image block and that’s a service that we provide to some of our larger clients, but the related video shots right now, it’s pretty difficult to get a piece of content in. We invite our programming partner to Amazon video shots which is what is enabling us to put some of this content through. So we built our platform kind of on top of the Amazon APIs to make it really easy for you to either source your content from influencers and then get them into related shots or take existing content that you may have, let us know what ASINs those videos are for and then get those videos placed on your product pages. But yeah right now it’s not as easy as I think anyone would like it to be which is why we are happy to have built a platform that we think serves two needs, the sourcing of the content and then getting it out there in front of shoppers. Steve: What has been some of the ROI benefits just kind of editorially from some of your clients regarding those related short videos on Amazon products; do you have any data on that? Jessica: Yeah it’s a little difficult to share specific data from any of the campaigns that we’ve run, but I will say that all categories are different and when we look at things kind of more broadly in the past, we’ve seen upwards of 30% increase in conversion rate with just the presence of video, and so that’s thinking about a page that had zero videos within that related video strip or anywhere on the product page and then enhancing those pages with videos, and other metrics that we typically see go up when shoppers are watching video is basket size, purchase intent and then of course the conversion rate. So I’ve seen some categories go upwards in the 50% increase in conversion rate for shoppers that are watching a video, but on average we’re seeing in that 25 to 30% range, and again really looking at that pre post activity and then search for more of the sophisticated brands that maybe sell directly on their site. You can look at hard sales numbers, but that’s a little top for us on the platform to really understand because it’s looking at your own data that we’re not privy to. Steve: Okay and so these numbers that you quote are just based on like straight before and after so it might not be an exact science, but there is definitely a strong correlation towards those numbers? Jessica: That’s right and we’re always excited to dig into the data with our clients, and so whether the data that’s available in the Amazon portals or your own analytics, Google analytics, things like that. We are happy to help with the analytics behind it and again we understand that it’s not necessarily the easiest to isolate in any of these ecommerce platforms right now, the presence of video, the number of place the video had. So certainly for now until we all get a little bit more sophisticated about things as shoppers seek out more video content and video content finds its way into the ecommerce ecosystem a bit more, you definitely need to look at a couple of different data sources, and so we’re always open to partnering with customers to help them understand things and be able to make smart choices and having the best for them. Steve: Okay, oh hey Jessica we’ve been chatting for quite a while and I want to be respectful of your time, where can people find more about your company and how can they get a hold of you? Jessica: You can learn more about our company at Gen.video, that site provides a lot of the information on the influencer network and the ecommerce syndication, and then I’d be happy to talk to anyone, and so you can email directly to me at Jessica@gen.video as well. Steve: All right, well thanks a lot for coming on the show Jessica, I really appreciate it. Jessica: Yeah thanks Steve, it was great, take care. Steve: Hope you enjoyed that episode. In light of Amazon’s ban of incentivized reviews, influencer marketing is actually a great way to get real eye balls on your products, and I’ll actually be publishing my experiences with the Gen.video platform on my blog very soon. For more information about this episode, go to mywifequitherjob.com/episode162. And once again I want to thank Klaviyo.com for sponsoring this episode. Klaviyo is my email marketing platform of choice for ecommerce merchants, and you can easily put together automated flows like an abandoned cart sequence, a post purchase flow, a win back campaign, basically all of these sequences that will make you money on auto pilot. So head on over to mywifequitherjob.com/K-L-A-V-I-Y-O, once again that’s mywifequitherjob.com/ K-L-A-V-I-Y-O. I also want to thank Seller Labs as well. Their tool Ignite is what I use to manage my Amazon PPC campaigns. Instead of the old tedious way of generating reports and analyzing your ad campaigns in excel, Ignite aggregates all that info for you in one place and allows you to quickly visualize your data to make decisions fast. And if you’re interested in starting your own ecommerce store, head on over to mywifequitherjob.com and sign up for my free six day mini course. Just type in your email and I’ll send you the course right away via email, thanks for listening. Thanks Steve. Gen.Video sounds great (though somewhat expensive). But, I found out how to get video on Amazon page and that is terrific.